Motobatt motorcycle batteries debuted in 2009 and were designed to replace original equipment (OE) batteries. They are a premium battery that has taken the power sport industry by storm. Their initial goal was to reduce the staggering amount of confusing OE part numbers by introducing a single sealed AGM non spillable battery. This was accomplished by utilising detachable spacers and patented QuadFlex terminal technology. They have been successful in reducing 184 OE parts (at that time) down to just 32-part numbers. Their popularity keeps growing. 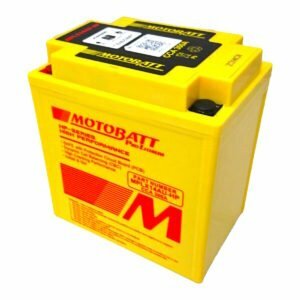 Motobatt has become the leading aftermarket producer of power sport batteries with a reputation for long life, high starting power and being able to be left for long periods without problems. Now Motobatt offer an increasing range of high performance Lithium starting batteries for race applications. LiFePo4 is a distinct Lithium technology that is safe, lightweight and gives outstanding performance when compared like for like to lead acid cells. Lithium batteries behave differently to traditional batteries and here at Rex’s we can guide you through some of the problems and pitfalls associated with the less well understood Lithium technology. Problems occur with both over charging and allowing a lithium cell to become over discharged. This is the reason we at Rex’s only stock the the -HP Motobatt Lithium range. These are not budget batteries but they come with protective circuits built in to save your expensive battery from damage and prevent voiding your warranty by over discharging the battery. This protection is distinctly different from cell balancing or thermal protection which is simply a required function that all lithium batteries must have to operate safely. While other vendors may be happy to sell cheaper versions we want our customers to have the best possible experience with this battery technology. It is entirely possible to permanently ‘shut down’ a lithium battery, with no way to recover it by cranking an engine that will not start or by leaving the lights on and the engine not running. Shutting down a battery by discharging it will not be covered by the warranty from any company, including Motobatt. These problems are avoided with the fully protected Motobatt HP range which automatically switch off the battery before any damage is done. Rex’s team of experienced electronics engineers can advise you via e-mail. Questions such as do you need a lithium type charger are common. The answer is ‘yes’ you most certainly do. A lead acid type charger will never fully charge a lithium battery so we stock the correct Motobatt charger needed to bring any lithium to fully charged. Another commonly asked question is ‘do I have to leave the battery on maintenance charge?’ Even Motobatt say you do not, however our advice, based on our personal experience of racing and road motorcycles is that you definitely should leave them on a proper maintenance charger. Although Motobatt Lithium batteries can be fast charged to 95% in 5 minutes, there’s nothing more annoying than finding your motorcycle battery flat after Winter. Rex’s have a good range of Motobatt LiFePo4 batteries in stock and being electronics experts can offer sound avice.